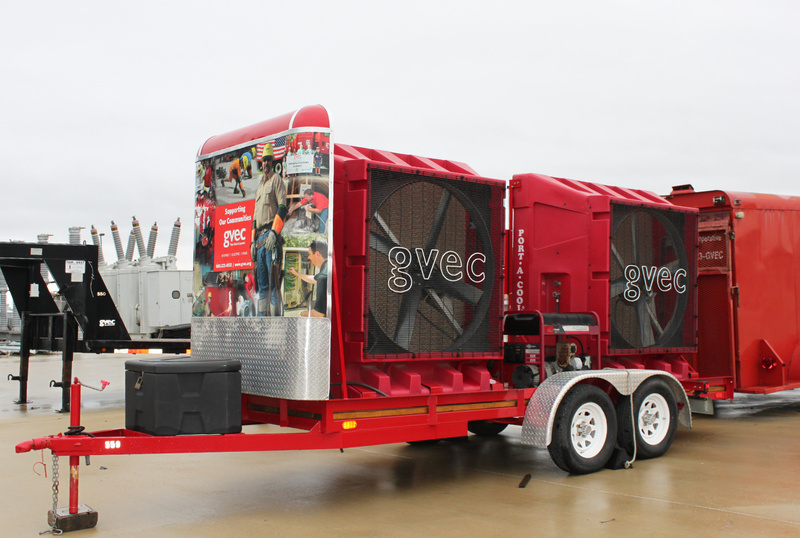 Port-A-Cool fans are just another way GVEC is there for members. Many nonprofit organizations and communities in our service area hold celebrations and fundraisers during the summer when it’s scorching hot. We offer these outdoor cooling units, free of charge, to help make events more successful and pleasant for guests. Port-a-cools are available for use, free of charge, at public events such as a community picnic, church or fire department fundraiser, or other similar event. GVEC Energy Solutions staff will deliver, set up, and pick up the fans on the scheduled date and time. Just remember to make your reservation for a Port-A-Cool system as soon as possible since events in different areas are often held on the same day or weekend. About a month prior to the date, we consider all requests, schedule the fans, and get in touch with you. Due to the number of requests we receive, private parties and events don’t qualify for the service. There must be water and electricity available and accessible at the site. Fill out your request to reserve a Port-A-Cool below or make a request through SmartHub. If you have questions, call us at 800.223.4832. Stay current on our news and monthly articles as well as get valuable energy efficiency tips and much more.